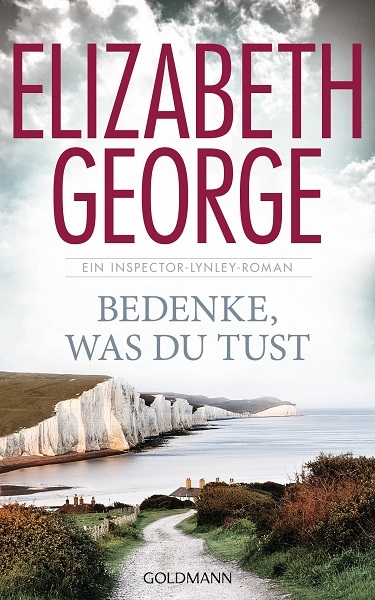 In her latest novel “A Banquet of Consequences” (in German: Bedenke, was du tust, released by Goldmann Verlag), Elizabeth George succeeds once again to keep the tension on more than 600 pages and lead us readers astray. This is the new sequel of the exciting detective series featuring the already well-known investigative team, the aristocratic Inspector Thomas Linley and the inconspicuously dressed, obnoxious Havers as an interesting duo. This time the investigation is lead from two locations. Barbara Havers, who is strictly observed by the eagle eye of their boss, is coincidentally drawn into this case and tries to prove to her boss that she’s a good cop. At her side Winnie Nkata, with strict orders not to have Havers do anything all by herself. Thomas Linley supports his colleagues with his charming and typical British style from a London base. The case seems complicated, because it looks as though there is no motive to kill the victim, yet she ended up dead. Was it an accident? Or suicide? These questions keep tormenting Havers and Nkata, until they find more explosive evidence. But can Sergeant Havers regain her good reputation? Elizabeth George keeps her readers on the edge and ensures surprising events and turns popping up in the end. One of the best writers of mystery novels ,and if you are a fan of suspense literature, her works should be on top of your reading list.